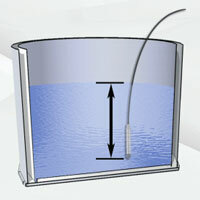 What are Thermo-Anemometers or Hot Wire Air Velocity Sensors? 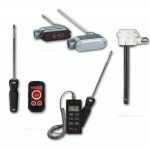 Dwyer Instruments, Inc. offers many air velocity measuring products that use thermal or hot-wire sensors as the sensing element. 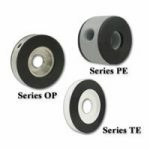 There are fixed duct mount styles for continuous monitoring, such as the Air Velocity Transmitters, Series 641, and portable insertion styles for testing, such as the Thermo-Anemometer Test Instrument, Model 471B and the Thermo-Anemometer Probe, Series AP2. 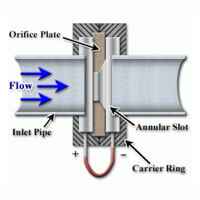 Dwyer Instruments, Inc. offers many types of flow measuring products including orifice plates, which are used as a flow sensing element with a differential pressure monitor. 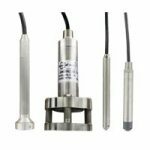 The Mercoid® Division of Dwyer Instruments, Inc. offers four series of submersible level transmitters with different features suitable for different applications: the FBLT, PBLT, MBLT, and SBLT. 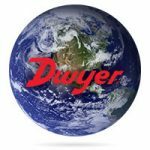 Dwyer Instruments, Inc. offers many temperature measuring products that use bimetal sensors as the sensing element. 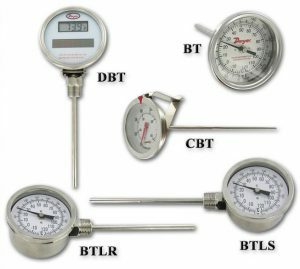 Bimetal Thermometers measure temperature based on the differences in thermal expansion properties of metals. 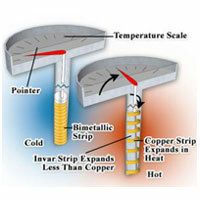 Pieces of metals with different thermal expansion coefficients are attached to each other in an assembly.